Something terrible happened yesterday: nobody visited my blog! I mean really–how am I supposed to live more simply if you’re not reading about it? Trust me, I get the irony of blogging daily about living simply. I also get that nothing is ever written without some audience in mind (even if that audience is only a future self). And I also fully accept that it is downright blogger blasphemy to say I’m never going to pay attention to my site’s stats, or that I will do nothing to try to grow an audience. You don’t have to get to know me for too long to realize that I tend to get a bit obsessive about, well, whatever I have the opportunity to get obsessive about. So, give me a great tool like WordPress to play with, and sure–I’ll start obsessing on my numbers, and who is finding me through which search terms, and from what countries. And so on. It struck me, though, that if I am going to get too obsessed about traffic, and likes, and comments, and so on, then I’m really (stating the obvious here, I know) losing sight of why I started this blog in the first place. My goal is to chronicle a yearlong experiment in living simply–and hopefully more deliberately–not to blog for a year and find stuff to fill each daily entry, attracting a large and constantly growing audience along the way. At least that’s what I think my goal is…. So today’s challenge: ignore all those stats! So, I peeked this morning. Not a lot of traffic again today. 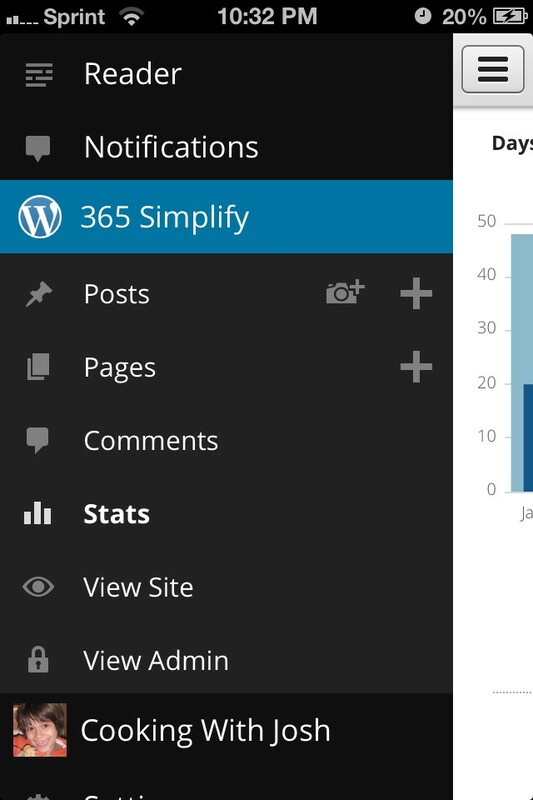 I had to make a conscious effort the rest of the day to avoid clicking on the WordPress app on my phone. Then I peeked again around 10:30, but only because I needed to get a screen capture for this blog post. It’s going to be a tricky line to ride for the rest of this year, I can tell. I want to stay with the commitment of a daily experiment, and a daily blog post reflection on that experiment: but how do I keep the process of this daily practice from becoming too self-reflexive, or too gimmicky? Or too self-indulgent? So as halfhearted an attempt as I made today to ignore those stats, it at least provided me with an opportunity to reflect on the process of building a daily practice. If writing a blog is the necessary scaffolding, then perhaps I need to ignore the fact that sometimes that scaffolding may be more obvious than at other times–and sometimes it may be all that I can see. But as long as I’m continuing to build a practice, I can live with that. This entry was posted in Uncategorized and tagged blogging, data overload, ego, media, simple action, technology. Bookmark the permalink. I’m here every day reading on my email so invisible to WordPress. I’m going to therapy … I’ll be ok! Yay! But your blog had much better pictures! I don’t get on here every day but I usually catch up at one point during the week! Love your posts, I am trying the simple life this year too so am definitely getting inspiration from you! Ever thought of not having the app to check each day? Too scary? Just a thought!! Thanks for the feedback, Kellie! Yeah, it would be simpler to take the app off my phone–and there may be a daily experiment down the line where I strip my phone of a lot of apps that tend to distract me. I’m definitely not quite ready for that one!